UPDATE, 11 a.m.: Papa Gino’s has confirmed to the Boston Globe that it filed for Chapter 11 bankruptcy. Parent company PGHC Holdings Inc. shuttered about 95 locations, and has reached an “agreement in principle” to sell Papa Gino’s to Wynnchurch Capital. You might be in need of a new go-to pizza place. Over the weekend, locally-born chain Papa Gino’s closed dozens of its locations in New England, including pizzerias in Lowell, Westford, Bedford, Nashua, and Fitchburg, the Lowell Sun reported. In the Boston area, Arlington, Medford, Malden, Woburn, and Brockton locations have also shuttered; WPRI Eyewitness News reports four Rhode Island restaurants are closed, too. The East Boston-born, Dedham-based company at one point had more than 150 outposts in New England, per company information on Papa Gino’s website. As of Sunday, the location map feature lists 97 stores, including 78 in Massachusetts. The closings were sudden, even to Papa Gino’s employees. The Lowell Sun interviewed a manager-in-training, who arrived on Sunday evening for his second-ever shift at the Lowell restaurant to find the door locked. “I was supposed to work 5 to close. They didn’t inform me or anything,” Shadane Richards told the newspaper. WBZ also talked with a blindsided employee in Mansfield. The Boston Globe talked to another who was suddenly out of work after a Quincy location shuttered. Boston has left phone messages for members of the Papa Gino’s marketing team for more information about the sudden, region-wide closures, and has also sent an email to the company through its website. The Papa Gino’s company started in East Boston in 1961 as Piece O’ Pizza. In 1968, it changed its name, and began expanding around Boston and beyond. The company also owns D’Angelo Grilled Sandwiches. 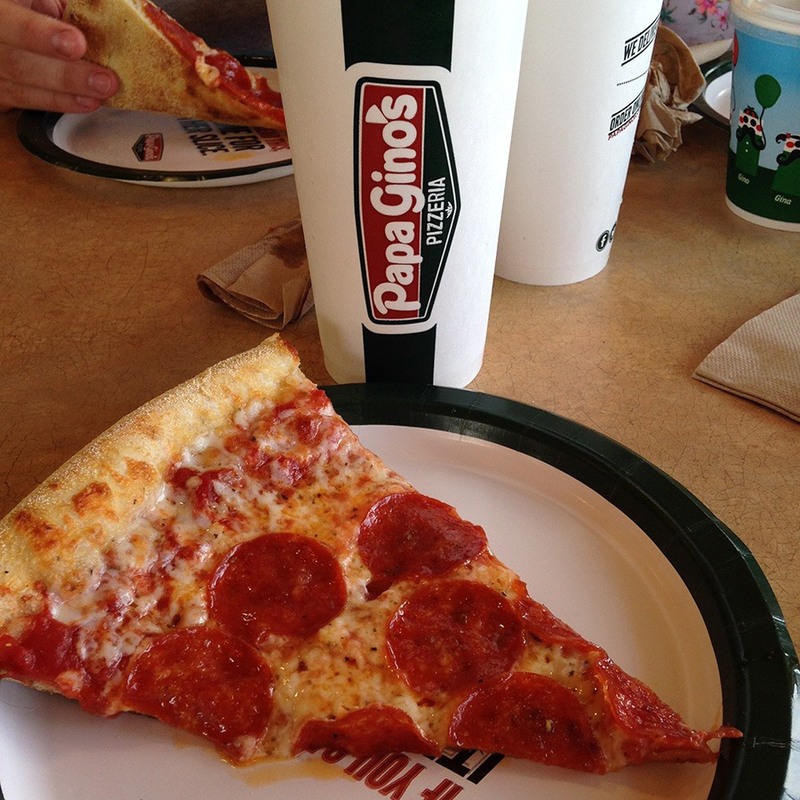 Papa Gino’s is a nostalgic taste of New England for many who grew up here. The sit-down pizzerias hosted many a pizza-fueled birthday party, and some schoolchildren—like myself at Berlin Memorial School—grew up eating the thin-crust pies every week in the cafeteria as part of a prolific school lunch program. It’s not the first fondly remembered Massachusetts pizzeria to close a bunch of locations this year. Bertucci’s shuttered 15 restaurants around the time it declared Chapter 11 bankruptcy in April. The Northborough-based company has since been acquired by the owner of Planet Hollywood, Buca di Beppo, and Earl of Sandwich.